Once you have established a morphing sequence, you can control its timing and velocity. When you look at your animation you will notice that the morphing motion is constant. To produce a less mechanical motion, you will probably want to create some ease in or ease out. 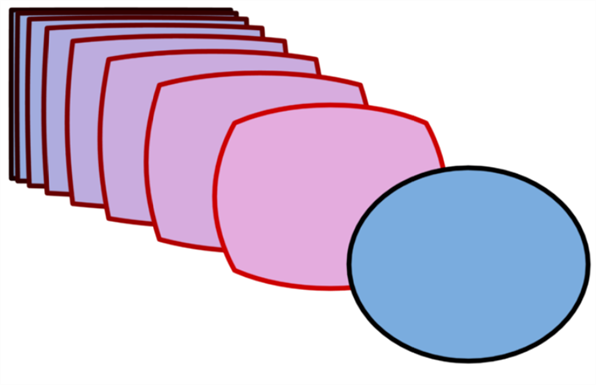 If you did not place your source and destination drawings on the correct frames you may need to extend or shrink the sequence length. 1. In the Timeline view, select the source or destination drawing. 2. Click on your selection and drag the drawing to its new frame. You can have two levels of easing. 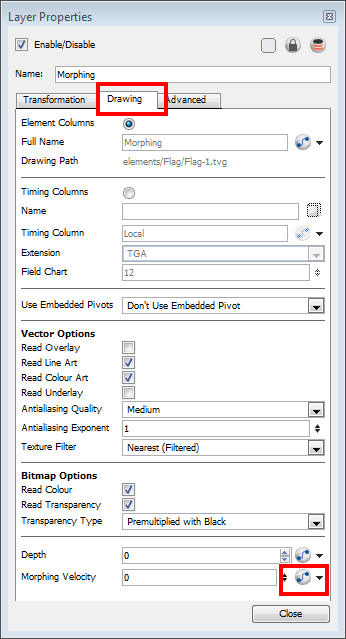 It is possible to adjust the velocity of each sequence in your layer independently using the Tool Properties view and then adjust the morphing velocity function in the Layer Properties editor to control the entire layer's easing. 1. In the Timeline view, double-click on the drawing element module to open the Layer Properties editor. 2. In the Layer Properties editor, go to the Drawing tab and click on the Function button to create a function curve. 3. In the Layer Properties editor, click on the Function button once more to open the velocity curve. 4. Add a keyframe at the first frame of the morphing (Source) and one at the end (Destination) by clicking on the Add/Remove Keyframe button. 5. Move the end keyframe up. It is important that the last keyframe remains above the first one. 6. Make sure that the first keyframe is NOT a Stop-motion keyframe. To do this, uncheck the Stop-motion Keyframe option to disable it. To use the Toggle Stop-Motion Segment feature, press [S]. 7. Click on the keyframes and pull the Bezier handles to create ease in and ease out. If you make the curve go downward instead of upward, the animation will play backward until the curve starts to go upward again. If you have more than one morphing sequence in the same layer, you need to add a keyframe on the velocity curve for each source and destination drawings. If you want your morphing to play back on a double frame exposure rather than single frame, you can use the Hold Value editor and set the velocity to change every second frame, instead of every frame. 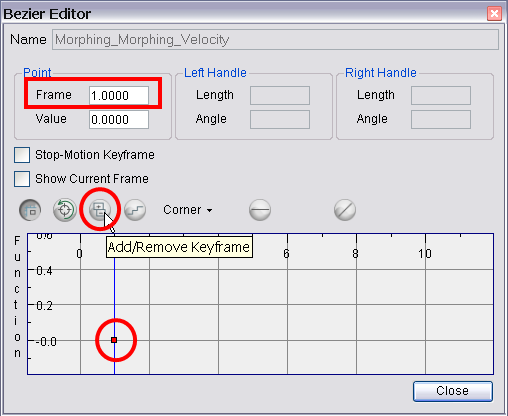 In the Morphing Function editor, click on the Hold Value Editor button and set the parameters to hold the value for two frames.